The Rainbow Lorikeet or Trichoglossus haematodus (T.h. ), an Australasian parrot species, inhabits rainforest, woodland regions and coastal areas. Australia, New Caledonia, eastern Maluku, Papua and Western New Guinea, Vanuatu and the Solomon Islands are all home to the Rainbow Lorikeet. In Australia, it is commonly seen on the east, from Queensland to South Australia and northwest Tasmania. Rainbow Lorikeets belong to the Psittacidae family, of the order Psittaciformes, and some subspecies are regarded as separate species Rainbow Lorikeets have been introduced to New Zealand and Hong Kong and to areas of Western Australia. The Red-collared Lorikeet (T. rubritorquis) was once considered a subspecies of the Rainbow Lorikeet, but is now regarded as a separate species. 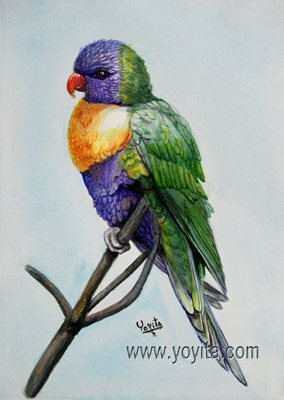 A 1997 review recommended splitting off, as separate species some of the taxa from the Lesser Sundas, namely the Flores Lorikeet (T. weberi), he Marigold Lorikeet (T. capistratus) and the Scarlet-breasted Lorikeet (T. forsteni). With these as separate species, the Rainbow Lorikeet includes the following subspecies (in taxonomic order); most of the common names listed below are only used in aviculture. The length of the Rainbow Lorikeet is from 25cm to 30 cm (9.8 to11.8 in) with a wingspan of about 17 cm (6.7 in). The weight varies from 75 to 157 g (2.6 to 5.5 oz). This parrot has very vivid plumage, with an orange beak, a deep blue head and greenish-yellow nuchal collar, and the back and tail are deep green. The upper surface of the wing is green, the lower red with a yellow bar. It has a red chest with blue-black barring and a deep green belly. Its thighs and rump are yellow, barred with deep green. Both sexes have the same coloring, with juvenile birds having a duller plumage. The best known subspecies T. h. moluccanus has similar markings to those of the nominate species, but with an orange breast with little or no barring, and a blue belly. Other subspecies range between nominate race and T. h. moluccanus. T. h. flavicans and T. h. rosenbergii are the exceptions. In T. h. flavicans the green of some parrots is dull, almost olive green, but in others the green hue is closer to that of the Rainbow Lorikeet. T. h. rosenbergii is more distinctive with several unique features: Its wing-bars are deep orange and don't contrast with the red underwing, the nape is yellow bordered by a narrow red band with broad dark blue barring on the red chest. Rainbow Lorikeets often travel in pairs and may respond to calls to fly in a flock, then dispersing into pairs. Rainbow Lorikeet pairs will aggressively defend their nests and feeding sites against Rainbow Lorikeets and other bird species, chasing off not only smaller birds, but also birds as large and powerful as the Australian Magpie. The diet of the Rainbow Lorikeet consists of fruit, pollen and nectar. The bird a tongue adapted especially for this diet. The end of the tongue has a papillate appendage evolved to collect nectar from flowers. Eucalyptus nectar is a main ingredient in Australia, other nectar sources are Grevillea, Spathodea campanulata (African Tulip-tree), Pittosporum, and sago palm. In Melanesia coconuts are a main food source, and Rainbow Lorikeets are important pollinators. They also eat the fruits of Ficus, Trema, Mutingia, and mangoes and papaya already opened by fruit bats. They eat apples, and will raid maize and sorghum. They are frequent visitors at garden bird feeders, which may contain store bought nectar, sunflower seeds, and fruits such as pears, grapes and apples. In places such as campsites and suburban gardens, wild lorikeets are accustomed to humans that may be hand-fed. The Currumbin Wildlife Sanctuary of Queensland, Australia, has thousands of lorikeets, and at 8am and 4pm each day the birds flock noisily to the park's main area. Visitors feed them a specially-prepared nectar, and the birds will happily settle on heads and arms to consume the nectar. Wild Rainbow Lorikeets can be fed by visitors at the Lone Pine Koala Sanctuary of Brisbane, Australia. Semi-tame lorikeets are common visitors to Sydney backyards, often congregating in large numbers. Many zoos and animal parks outside Australia have feeding facilities for Rainbow Parakeets. Breeding usually occurs during spring (September to December down-under), with regional variating due to food availability and climate. Nesting sites vary and can include hollows of tall eucalyptus trees, or overhanging rock. In the Admiralty Islands, lorikeets nests in holes in the ground islets free of predators. Pairs may nest in the same tree as other Rainbow Lorikeet pairs, and will also nest in tress containing other bird species Each pair produce one to three eggs, incubated, by the female alone, for around 25 days. The Rainbow Lorikeet population is widespread and common in some areas. It of Least Concern by BirdLife International. Some localized subspecies are more precarious, with T. h. rosenbergii (which possibly may be treated as a separate species) threatened by habitat loss and capture. Rosenberg's or Biak Lorikeet, T. h. rosenbergii - Biak Island, Indonesia. Very distinctive, and possibly worthy of treatment as a separate species. Blue-faced Lorikeet, T. h. intermedius. - north coast of New Guinea. Not always considered distinct from T. h. haematodus. Green-naped Lorikeet, T. h. haematodus - southern Maluku, West Papua islands and western New Guinea. Dark-throated Lorikeet, T. h. nigrogularis - Kai Islands, Aru Islands and southern New Guinea. If T. h. caeruleiceps is recognized, T. h. nigrogularis is restricted to the Kai and Aru Islands. Brook's Lorikeet, T. h. brooki - Spriti Island in the Aru Islands. Not always considered distinct from T. h. nigrogularis. Pale-head Lorikeet, T. h. caeruleiceps - southern New Guinea. Not always considered distinct from T. h. nigrogularis. Southern Green-naped Lorikeet, T. h. micropteryx - east New Guinea. Ninigo Lorikeet, T. h. nesophilus - Ninigo and Hermit Groups, west of Manus Island, Papua New Guinea. Olive-green Lorikeet, T. h. flavicans - New Hanover Island, St. Matthias Islands and Admiralty Islands. Massena's or Coconut Lorikeet, T. h. massena - eastern New Guinea, Louisiade Archipelago, Karkar Island, Bismarck Archipelago, Solomon Islands and Vanuatu. Deplanche's Lorikeet, T. h. deplanchii - New Caledonia and Loyalty Islands. Swainson's Lorikeet, T. h. moluccanus - eastern Australia and Tasmania. The population of the Cape York Peninsula and the Torres Strait Islands is now often treated as a separate subspecies, T. h. septentrionalis. Genre works, also called genre scenes or genre views, are pictorial representations in any of various media that represent scenes or events from everyday life, such as markets, domestic settings, interiors, parties, inn scenes, and street scenes. Such representations may be realistic, imagined, or romanticized by the artist. Some variations of the term genre works specify the medium or type of visual work, as in genre painting, genre prints, genre photographs, and so on. Genre painting Genre painting, also called genre scene or petit genre, depicts aspects of everyday life by portraying ordinary people engaged in common activities. One common definition of a genre scene is that it shows figures to whom no identity can be attached either individually or collectively - thus distinguishing them from history paintings and portraits. A work would often be considered as a genre work even if it could be shown that the artist had used a known person - a member of his family, say - as a model. In this case it would depend on whether the work was likely to have been intended to be perceived as a portrait by the artist - sometimes a rather subjective question. The depictions can be realistic, imagined, or romanticized by the artist. Because of their familiar and frequently sentimental subject matter, genre paintings have often proven popular with the bourgeoisie, or middle class. The petit name contrasts this with the grand genre, history painting. Genre themes appear in nearly all art traditions. Painted decorations in ancient Egyptian tombs often depict banquets, recreation, and agrarian scenes, and even medieval prayer books such as the Book of Hours (see Les Tres Riches Heures du Duc De Berry) are decorated with "peasant" scenes of daily life.